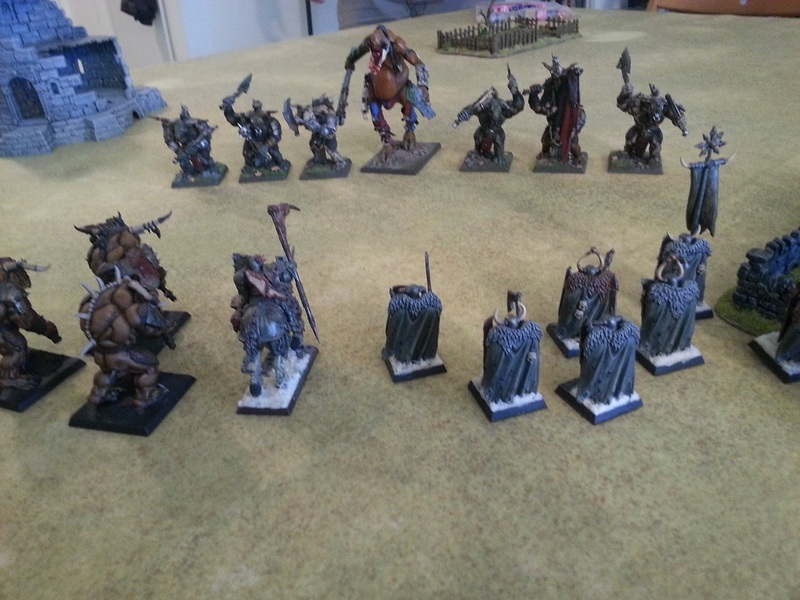 A game using Andrew's 'ancient' Ancient figures. Babylonians vs Elamites in this clash of chariots, about 1100 BC. Below is set up with me invading. Note fields on left and plantation on right, each of which has an ambush marker. 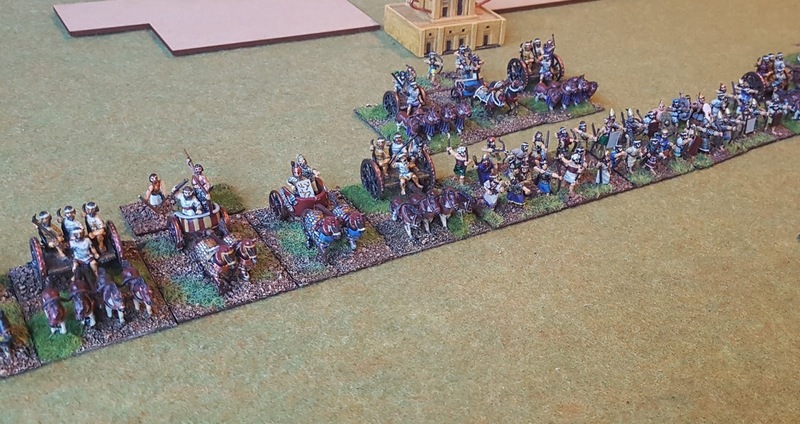 I have my chariots in the centre (mix of ordinary and elite), and infantry on wings (spearmen and mediocre archers), Andrew's composition is the opposite with chariots on the wings (ordinary and elite again), and ordinary class archers in his centre. Andrew's archers in the centre. 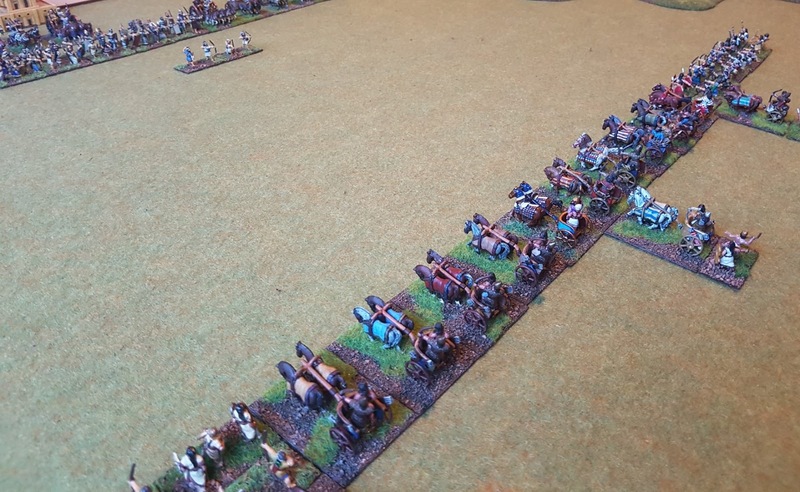 I launch the attack advancing most of the line, with some chariots held back as a reserve, and sliding across towards the flanks to counter any ambush. Andrew responds by moving forward his archers to release a volley at my chariots, hitting one of them. But I charge the archers with most of my chariots. Some light archers in the fields on my left which have been lying down in ambush stand up and fire, and my archers back at them. The chariot charge is mostly successful, with three blocks of archers taking 2 out of 3 hits and likely to be finished off next turn. Next round Andrew sensing his centre is about to collapse, reveals more light archers on my right, and advances his chariots, inflicting shooting casualties on my force but also taking them in return. 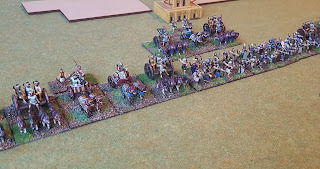 My chariots break through the centre of the Elamite line, though Andrew has a second line waiting to reinforce. 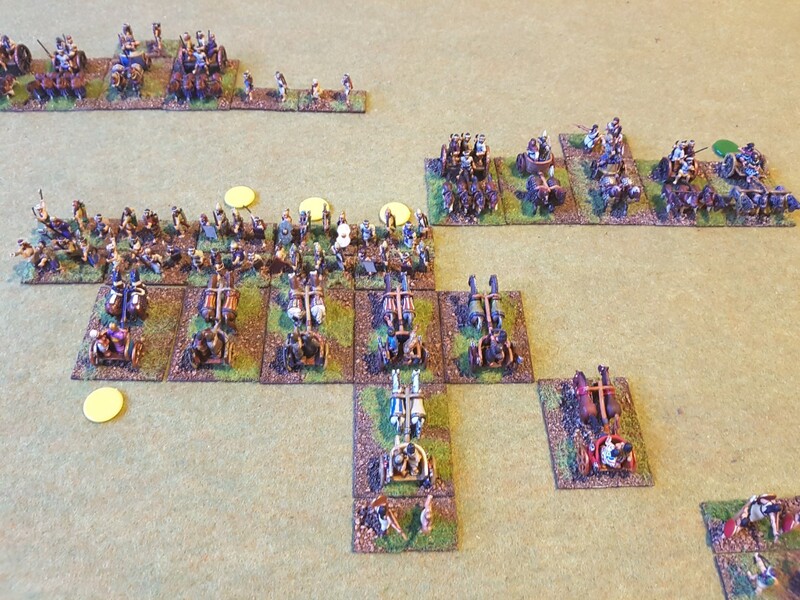 Andrew's chariots and light archers disrupt my left flank infantry with shooting. 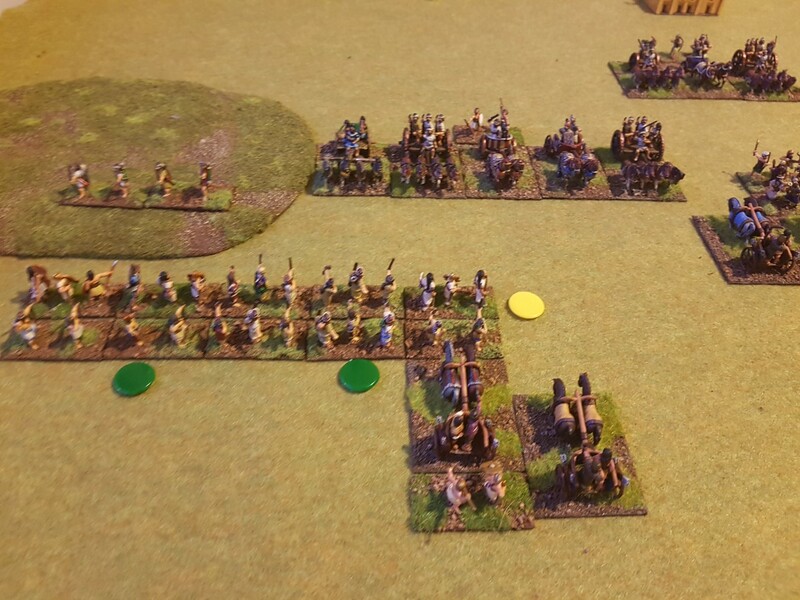 Casualties accumulate rapidly on both sides with practically everything able to shoot and little armour available to stop arrows! Elamite chariots run down some infantry on my left and right but others are shot down, and my chariots continue to wreck the Elamite centre. Elamite light infantry on the flanks is chopped down by spearmen (only just on the left where they had taken heavy casulaties before charging), and more Elamite chariots are lost. The Elamite army breaks with over 25/25 units lost. Victory to the Babylonians, though their break point is at 16/22! A quick and deadly game with everything light armoured mediums (3 hits each) or lights (2 hits), and lots of dangerous shooting. The Elamite archers exposed themselves by advancing too far forward of their line, and without their flanks supports were run down by the elite Babylonian chariots. This early disadvantage led to the battle of archery and melee attrition tipping towards the Babylonians, and the Elamite counterattack was unable to swing the tide! 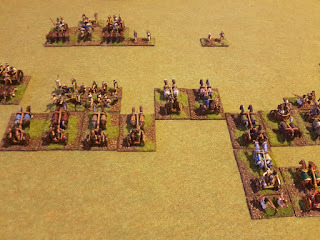 Keen to try a couple more 'ancient' Ancient armies soon. A fine looking game, Mark. As you know, I am a fan of chariot era armies! Yes you've done some entertaining reports thanks Peter!